Hello there friends!! We have some exciting news for you! 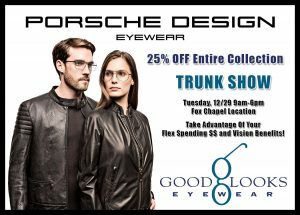 We are pleased to invite you to our Good Looks Eyewear Porsche Design Eyewear TRUNK SHOW @ our Fox Chapel Store Location~ DECEMBER 29th 9am-6pm!! Receive 25% off the ENTIRE COLLECTION!! Don’t miss out on these end of the year savings! Flex Spending, Health Savings, and Care Credit are also accepted.